This bill was not passed. The Senate floor vote for this bill has been postponed until Monday. For those of you watching this issue closely, this bill will be up for a Senate floor vote today. You can watch the California Senate live here. The California capital opens at 9am, so if you haven’t already called your state Senator to tell them how you feel about AB 1306, tomorrow is the time. All my thoughts on AB 1306 can be found below. I have thought about AB 1306 for so many hours since I initially opposed it last Friday and I’m feeling really conflicted about it. Let me share with you why. Removing physician supervision will improve the ability of CNMs to practice autonomously including offering VBAC in the hospital setting (where hospital policy permits) and in birth centers (provided the CNM opts to offer VBAC). This could be a good thing for VBAC families and a great thing for all the other people CNMs serve. And so it’s really tough because it could negatively impact the small number of women who plan home VBACs by requiring them to have a VBAC consult with an OB. So, what is the right decision? Support this bill so CNMs can have a greater reach? Or oppose this bill because of this requirement? My mission is to increase access to VBAC in all birth settings. Is it enough that this may increase hospital VBAC access – where most women birth – as well as birth center VBAC while possibly making home VBAC harder to achieve? 44% of CA hospitals outright ban it. They do not “allow” their physicians to attend VBAC. What happens if those hospitals decide, they will not “allow” their physicians to even consult with families seeking out-of-hospital (OOH) VBAC? Or physicians say that their malpractice insurance will not “allow” them to consult with OOH VBAC families? Where does that leave OOH VBAC families? Right now, the VBAC rate in the state of California is only 9%. This bill could increase VBAC access in birth centers and hospitals assuming that hospital policy “allows” CNMs to attend VBAC. As it stands, 91% of California families have repeat cesareans and the overwhelming majority of those are due to VBAC bans, misinformation and being unable to find a supportive provider. But here’s the tough part: OBs who are staunch supporters of VBAC have told me that they would never have a consultation with a woman planning a home VBAC because they don’t, in any way, want to be connected with something that could be construed as validating, okaying, or approving home VBAC. Even though the legislation isn’t asking OBs to approve of home VBAC, that is what OBs see. And the overwhelming majority of OBs – who support hospital VBAC and may even philosophically agree with OOH VBAC – would not participate in VBAC consults for women planning home VBACs. This is mitigated a bit by the fact that women can have these consults via a chart review and Skype. So regardless of where they live in the state, they could reach the handful of OBs willing to participate in a VBAC consult. But having the VBAC consult in the legislation means that as OB allies die, or as hospital policies tighten, or malpractice insurance fears increase, the legislation holds firm. It leaves women standing out in the cold on their own. And forces them to go back to the hospital system, where, as we see from the current California VBAC rates, they will likely acquiesce to a cesarean or be forced into a cesarean per hospital policy that is presented as equivalent to law unless CNMs are able to measurably increase VBAC access in the hospital setting. CNMs can tell families that the prior cesarean is “unlikely to impact this pregnancy” and then talk about the unlikely though possibly dire consequences if a uterine rupture occurs out of the hospital. And talk about transfer protocols as you would with any other patient. Women don’t need to talk to an OB in order to get that information. So while this bill does include home VBAC in the language, access to home VBAC is assuming that the pregnant person can find a OB who is willing to provide them with this consult. While the option is there, the ability to exercise that option is based on the kindness and ethics of a few OBs. And when they are gone, or the climate changes, women bare the brunt of their absence. A VBAC consult does not make pregnancies safer. It will not improve outcomes. It only undermines the professional training of CNMs and the autonomy of patients. And all the while, this bill also removes physician supervision from CNMs. And that is a very good thing. So, do we say to home VBAC families, “Best of luck to you?” and, “Removing physician supervision for CNMs is worth this trade?” and then hope and pray that these women can find an OB willing to provide them with this consult? I’m sharing with you the pros and cons as I see them so you can make your own decision. Does your state require families planning home VBACs to have a consultation with an obstetrician? If yes, I’d like to ask you a few short questions. Thank you to those that contacted your Assembly Member today! The deadline to amend the bill to exclude the VBAC consult was Friday. The next step is to oppose the Senate floor vote which is expected to happen next week (the week of Aug 22nd). Please contact your state Senator on Monday, August 22nd, and tell them, “I’m calling to voice my opposition to AB 1306.” That’s it. Yesterday I was in Sacramento attending the Midwifery Advisory Council meeting at the California Medical Board. At that meeting, I learned about a piece of legislation that will decrease VBAC access in California. TODAY IS THE LAST DAY TO VOICE YOUR OPINION! If access to midwifery care for women who have had a prior cesarean section is important to you, then please register your opposition to AB 1306 unless amended to exclude VBAC consult with your Assembly Member or with it’s author – Assembly Member Autumn Burke. AB 1306 would remove physician supervision for Certified Nurse Midwives (CNMs). But here’s the bad part: it puts into statute (law) a requirement that any woman seeking to deliver with a CNM outside a hospital AND who has had a prior cesarean delivery must first have a consultation with a physician (AB1306 Sec 6, 2746.5(B)). • All women are capable of determining for themselves and their families, together with their midwife or health care provider, what measure of risk is appropriate for them. Requiring a physician consultation before they are able to continue midwifery care undermines patient autonomy. • Certified Nurse Midwives (CNMs) are highly trained health care professionals. They are quite able to determine, together with their client, when a particular woman would benefit from a consultation with a physician. • Requiring a physician consultation for every woman with a prior cesarean delivery does nothing to increase her safety in the current pregnancy. There is no way for a physician (or anyone else) to predict which pregnant woman is going to have difficulty with her current birth because she had a cesarean delivery in a prior pregnancy. • Requiring a physician consultation puts an increased burden on women. It may delay prenatal care, a known risk factor for prematurity, low birth weight and poor outcomes. It is costly and time consuming in the absence of evidence for benefit. • While collaboration between care providers is the idea, in many areas of California midwife/physician collaboration is not possible because there are no physicians willing to form this relationship. This reduces access to midwifery care and in many instances it also reduces access to successful vaginal birth after a prior cesarean. • Putting precise wording, regarding any medical condition, into statute disallows health care providers the use of the most recent research when helping clients make decisions regarding their care. Putting into law, the requirement for a physician consultation when a woman has had a prior cesarean delivery, will not allow women and their midwives to take into account the growing body of evidence surrounding the practice of a trial of labor after a previous cesarean (TOLAC), prior to determining the need for a physician consultation. I fully support CNMs and the important care that they provide to California families. But this bill is problematic because of how it will impact VBAC access for those who want an out-of-hospital VBAC with a CNM. Once again, call your Assembly Member or AB 1306’s author – Assembly Member Autumn Burke – TODAY and say, “I’m calling to voice my opposition to AB 1306 unless amended to exclude VBAC consult.” That’s it. I already called my Assembly Member and it took me exactly 36 seconds. If you live outside of California, please leave a comment on the author’s Facebook page so others who are learning about the bill realize the implications it will have on VBAC access unless amended. VBAC Facts own motto, “Don’t freak. Know the facts.” should apply to this issue as well. As a home birth CNM I ask you not to oppose this bill. It’s important to know how this caveat in the bill will affect boots-on-the-ground CNMs and their clients. There are nuances that can be explained, not by going to a single meeting of the MAC, but by mindfully investigating this bill and dialoging with the individuals who have worked tirelessly to thread the needle in a way that maximizes access. One such nuance is that we don’t need physicians to give their permission in the consult. Did we want VBAC consult in the bill? No. Did we explore every way around this demand by ACOG-IX? Yes. For what it’s worth, CNMs need to send clients for physician consults for any number of reasons. The safety of home birth depends on the these collaborative relationships. With current statute such collaborative access is tenuous at best, sometimes impossible. This bill address that. Collaboration, not supervision, will decrease the primary c/s rate, increase VBAC access across the board, and allowing safer care all around. Is it a perfect bill? Far from it. Will we ever have perfect? Nope. Is this a zillion times better that what we have now? YES! Will we continue to introduce new legislation? You betcha. Please don’t throw us under the bus. It seems from your comment that you didn’t read my thoughts above where I go through the benefits of this bill as well as how it will negatively impact women planning home VBACs. I understand that OBs do not need to give their permission. Please read what I wrote above before you comment so you fully understand my stance as opposed to how others characterize it. I’ve left swift comments before too, so no worries there. Florida requires a VBAC consult and there are very few who will do them. It is so bad that one doctor made periodic trips through the state to do the consults. Women had to pay an out of pocket fee for the consult. To my knowledge that Doctor no longer does that because it did create a legal relationship between her and the midwife who attended the birth, even if they did not intend to do so. She had to limit her consults to women who were being seen by midwives she intentionally established a relationship with. Home VBAC is often the only option women have to avoid unwanted and unnecessary surgery when hospital prohibit it in their facilities. Allowing CNMs to attend hospital or birth center VBACs won’t change the hospital’s prohibitive policy. This and more is already a problem in Arkansas. Californians you do not want any more government oversight and regulation. Right now in Arkansas women who desire a VBAC are mostly out of luck. It is illegal for a midwife to attend a woman who has had a prior c-section, but conversely many hospitals have bans either official or de-facto on the performance of VBAC. So most women have no options. Many drive 2 hours or more to birth in one of the few supportive hospitals, more are forced into unwanted repeat cesareans. I am a low risk woman, who has already birthed at home twice before, and yet I still have to seek an outside provider twice during pregnancy to request “permission” to have a home birth. It is insulting, and patronizing that my midwife and myself are “not allowed” to determine on our own if it is an acceptable risk to birth at home. No OBs that I am aware of will work in coordination with the midwives, leaving us to the long lines of the county health unit. I am fortunate enough to have a supportive local health unit, not all counties are so fortunate. When I needed non pregnancy related support from a physician, none would see me because I did not want to transfer care to them for the remainder of my pregnancy. I hope you will reject this bill, and send it back to be rewritten in a more autonomy affirming way, and I really hope that Arkansans will be able to achieve the freedom and autonomy that we need and deserve. Parents pregnant after a cesarean face so much misinformation about VBAC. As a result, many who are good VBAC candidates are coerced into repeat cesareans. 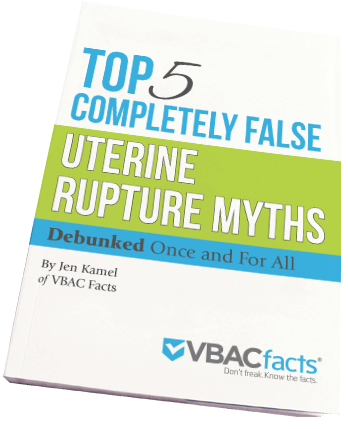 This free report provides quick clarity on 5 uterine rupture myths so you can tell fact from fiction.